The Most Reverend Robert John Renison is an important figure in the history of the Anglican Church of Canada due to his role as Metropolitan of the Ecclesiastical Province of Ontario. He also was known as a gifted writer of books and articles, and was a popular religion columnist for the Globe and Mail for over 20 years. He was born in 1875, in Ireland, in the little village of Clonoulty near Cashel in County Tipperary. His father was The Reverend Canon Robert Renison and his mother was Mary Elizabeth Renison (nee Kennedy), an American citizen that Canon Renison met while on a trip to the United States. Robert John Renison (Robert J. Renison) was the oldest of three boys, all of whom became Anglican (or Episcopalian) priests. In addition, he had three sisters. In 1914, he married Elizabeth Bristol of Hamilton, Ontario. They had two sons, Robert John Bristol Renison, (Robert J. B. Renison) born in 1916, and George Everett Bristol Renison, born in 1918. George Renison (d.1998) was married to Nancy Renison (nee Stirett) and had three children; Katherine, Carol and Michael. Robert J. B. Renison was married to Shirley Renison (nee Somerville) (d 1957) and had one son, Robert John (III). Robert J. Renison immigrated to Canada in 1880 when his father answered the call to serve as a missionary to the Ojibway on the shores of Lake Nipigon. He was educated at Trinity College School in Port Hope, Ontario from 1886-1892, on a scholarship for children of Anglican Priests, at the University of Toronto, where he received a B.A. in English in 1895, and at Wycliffe College at the University of Toronto where he received a degree in Divinity in 1896. He was ordained as a deacon in 1896 and as a priest in 1899. After graduating from Wycliffe College, he enlisted in the Royal Inniskilling Fusiliers under the pseudonym “Sergeant Patrick O’Reilly.” His first parish position was as a missionary priest near James Bay, Ontario, where he served until 1912. From 1912-1927 he was Rector of the Church of the Ascension in Hamilton, Ontario, except for a leave from 1918-1919 when he served as a chaplain in France for the 21st Battalion Expeditionary Forces during World War I. He was Rector of Christ Church in Vancouver from 1927-1931 and became Dean when Christ Church was made the Cathedral of the Diocese of New Westminster from 1929-1931. He was elected the Bishop of Athabasca in 1932, but only served in that role a few months before he was unexpectedly appointed as the Rector of St. Paul’s Church in Toronto. He served St. Paul’s Church on Bloor Street in Toronto from 1932-1944. In 1944, he was elected Bishop of the Diocese of Moosonee. 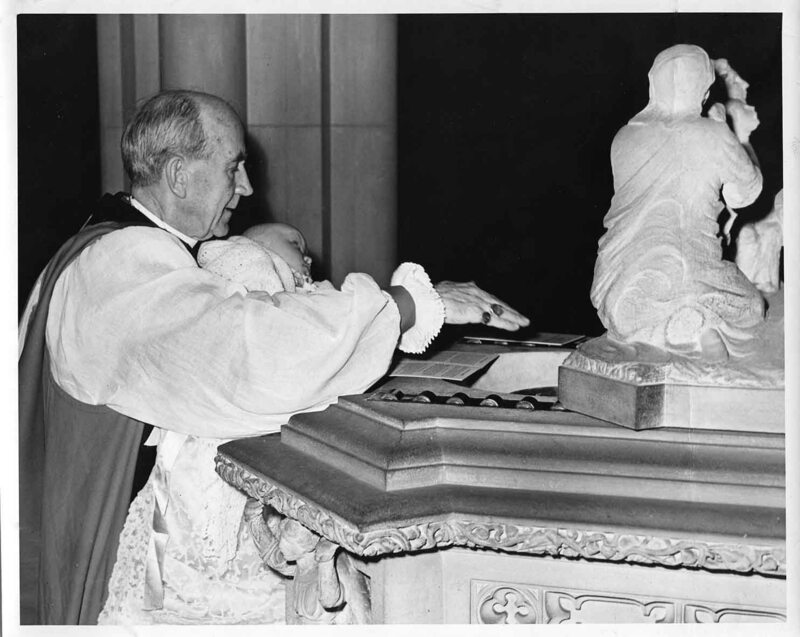 In 1952, he became the 9th Metropolitan (Head Bishop) of the Ecclesiastical Province of Ontario, a position he held until his retirement in 1954. The Most Rev. Robert J. Renison died in 1957. His funeral at St. Paul’s Anglican Church on Bloor Street, where he served as rector for many years, was packed with over 2000 mourners. A dedicated missionary, he spent much of his career serving First Nations communities in Northern Ontario, spending the first 14 years of his vocation in the James Bay region. He was fluent in Cree and in writing the Cree syllabary language, eventually writing a hymnal in Cree. He was given the name “Sheegoos” or “the good medicine which comes once a year” in Cree. Upon his election as Metropolitan, he declined the opportunity to serve in Southern Ontario, preferring to stay in the Diocese of Moosonee. He was considered to be a gifted orator with a strong intellect and a rich sense of humour. He was a talented writer, publishing a number of books besides his Cree Hymnal, including the Life of Bishop Sullivan, Canada at War, Wednesday Morning, (which was a selection of his editorials for the Globe and Mail), For such a Time as This, (which was a collection of his sermons), and One Day at a Time, (his autobiography). Starting in 1937, he wrote a popular newspaper column in the Globe and Mail which he continued until his death in 1957. As a result of his weekly column and his work as a priest and bishop, he was held in high regard by Anglicans in Ontario for his spiritual leadership. In September of 1941 he travelled to London, England as one of a number of Canadian journalists and writers, in his case representing the Globe and Mail, as a guest of the British Council. He left a legacy with his writings and books and also in the honours which were bestowed on him as a result of his life’s work. In 1959, the newly formed Anglican College in Waterloo, Ontario, Renison College, which would become later become affiliated with the University of Waterloo, was named in his honour. The Renison family remained in close contact with the college, with Archbishop Renison’s widow, Elizabeth, often being present for College events in early years. His son, George Everett Bristol Renison, a World War II hero and the founder and chairman of W.H. Smith Canada, served as Chancellor of Renison University College from 1986-1992, and as Chancellor Emeritus until his death in 1998. The Most Reverend Robert John Renison (1875-1957) fonds contains newspaper clippings collected by Bishop Renison (and later by his wife) about him or written by either himself or his wife. It also contains drafts of his writings, diaries, letters from him and to him and his wife, drafts and notes from his sermons, speeches by him or his wife, photographs and negatives including many from newspapers, his books with his notes (many in Cree), official documents and certificates and objects including academic robes and priest stoles as well as his war medals. A photograph of Bishop Renison baptizing his grandson, Robert John Renison (III) (Son of Robert J. B. and Shirley Renison (nee Sommerville), at St. Paul's Anglican Church, 1950. Photograph of Archbishop Renison in a bishop’s rochet and chimere, white stole, and a Canterbury cap. 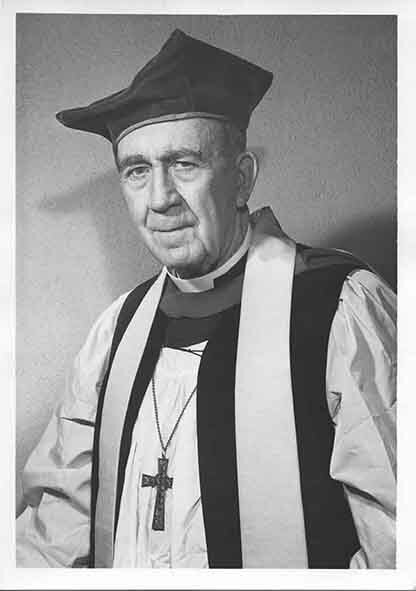 A Black and white photograph of Archbishop Renison in a bishop’s rochet and chimere, white stole, and a Canterbury cap. 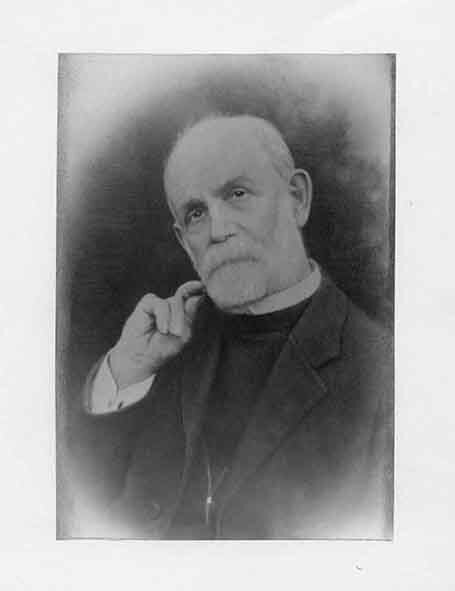 A black and white photograph portrait of The Reverend Canon Robert Renison, the father of Robert J. Renison. Canon Robert Renison died in a car accident in 1927 in Los Angeles, California, where he was an Episcopal Priest. 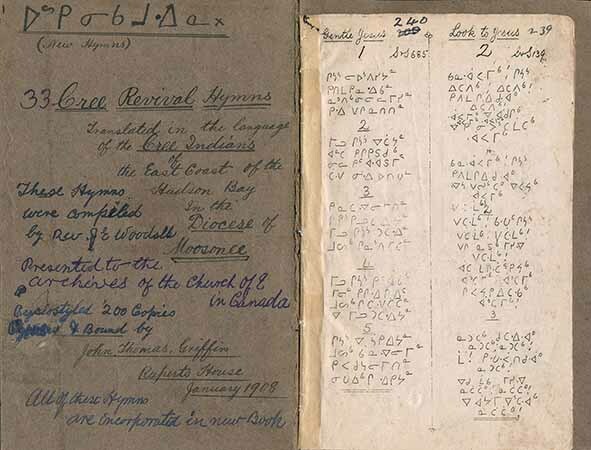 Bishop Renison wrote a short hymnal in the Cree Syllabary while he was a missionary in the James Bay region in the beginning of the 20th century. 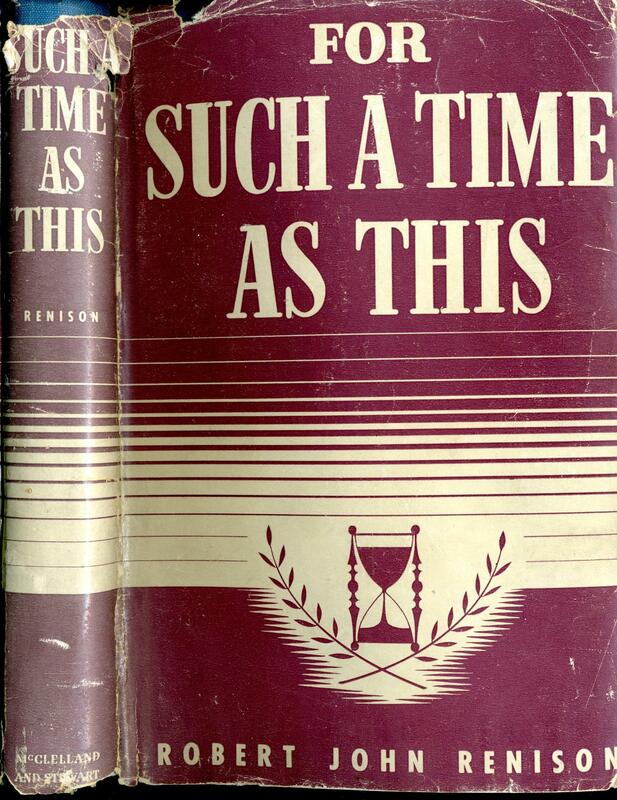 A colour copy of the cover of Bishop Renison’s book “For Such a Time as This,” published in 1947. This is a book of sermons, essays, and vignettes. 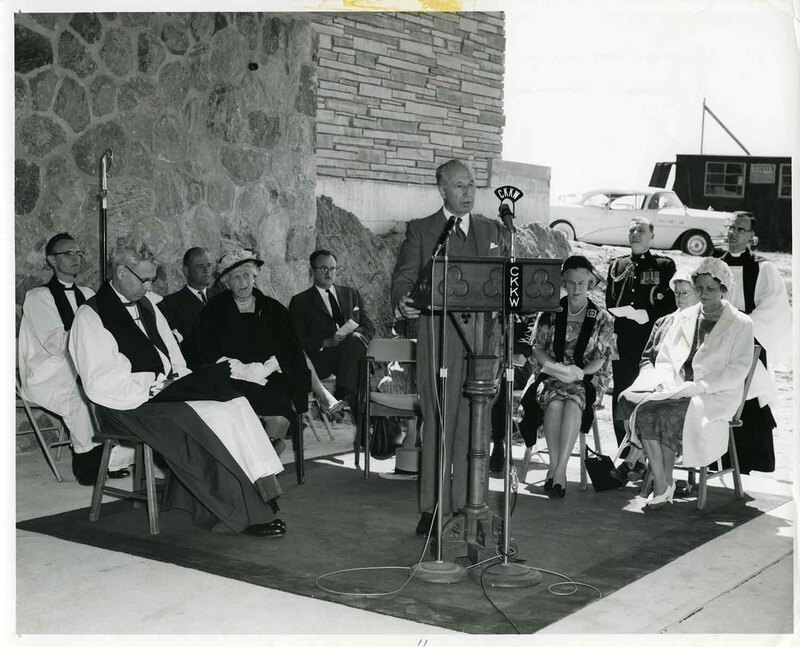 Photograph of the cornerstone laying of the Founders Building on Renison College’s present campus. 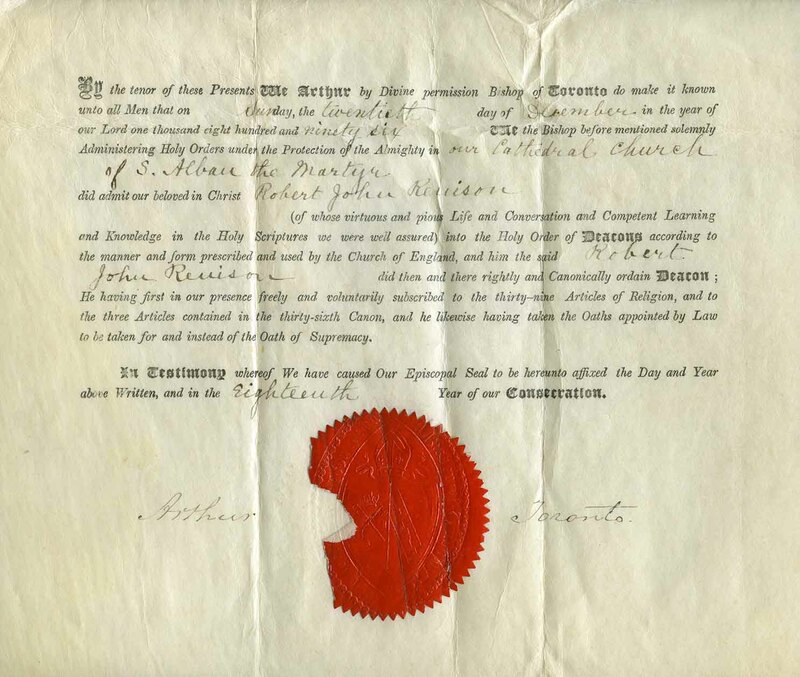 This is the certificate acknowledging Robert J. Renison's ordination as a transitional deacon in 1896. He was ordained a deacon in 1896, at the Cathedral of St. Alban's the Martyr, in Toronto.